A range of special interest and themed boat trips as well as scenic cruises around the Carmarthen Bay. The Llansteffan to Ferryside ferry, ‘Glansteffan’ is a high performance aluminium-hulled boat, fitted with a ‘Sealegs® Amphibious Enablement System’ which allows it to drive out of the water onto land. The boat seats 10 passengers, and up to 4 bikes or two wheel-chairs. Weather protection is provided by a well-designed canvas canopy, fitted with large sight panels. The canopy sides can be rolled up in good weather. 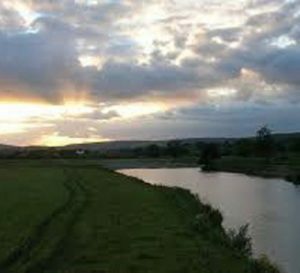 Setting off for a 30 minute cruise on the Towy river gives a pleasant introduction to the wealth of history on this most magnificent and longest flowing of all the rivers in Wales. There is wildlife in abundance if you carefully watch the river banks and surrounding woodlands, such as herons, egrets, cormorants, otters and Pete, the grey atlantic seal. Set off for 2 relaxing hours into the Three Rivers’ estuary and on to to Kidwelly Quay, where Principal Engineer Thomas Kymer, created the first canal in Wales here in 1768. 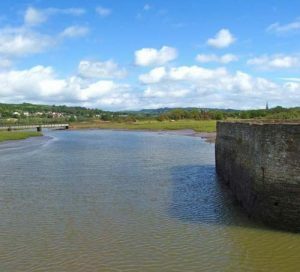 As well as the partially restored canal and dock, you’ll have views of Kidwelly’s wonderful Norman castle and the beautiful 13th century church of St Ishmaels. 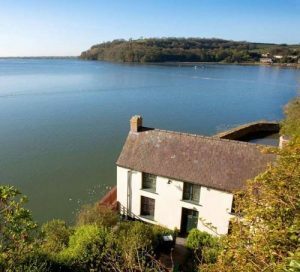 Enjoy 2 tranquil hours heading out into the Three Rivers’ estuary, and around to the historic town of Laugharne. The boat doesn’t land, but there are fantastic waterborne views of Dylan Thomas’ boat house and the majestic castle built in 1116. Note: at present wheel-chair users can only be accommodated if they can be accompanied by carers who can assist them. Pick up points for ferry crossings and trips are marked by feather flags on Llansteffan and Ferryside beaches.